Tropical Depression Gordon just doesn't want to give up. Gordon is meandering in the southern U.S. and satellites pinpointed its center over Arkansas on Friday, Sept. 7. Gordon continues to soak the southern U.S. and NASA's Aqua satellite located the strongest storms associated with the depression. 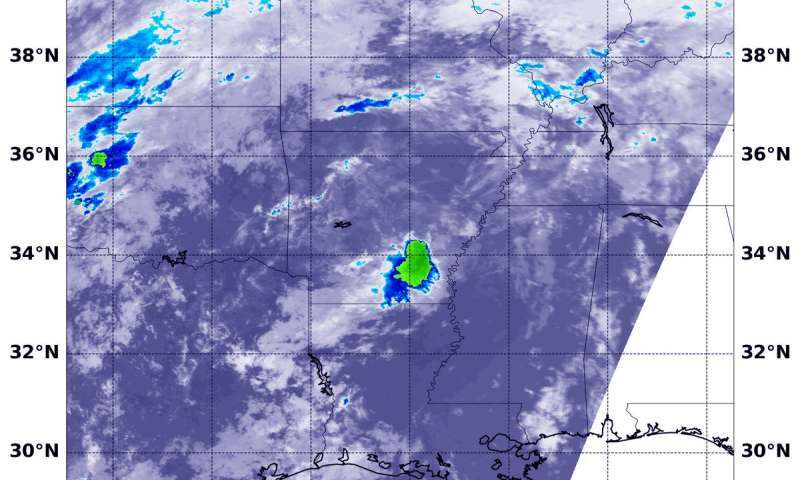 NASA's Aqua satellite provided an infrared look at clouds associated with Gordon and found its center over Arkansas. At 4:35 a.m. EDT (0835 UTC) on Sept. 7, the MODIS or Moderate Resolution Imaging Spectroradiometer instrument aboard NASA's Aqua satellite looked at Tropical Depression Gordon in infrared light. AIRS found coldest cloud tops had temperatures near minus 63 degrees Fahrenheit (minus 53 degrees Celsius) around the center over southern Arkansas. NASA research has shown that storms with cloud tops that cold are high in the troposphere and can produce heavy rainfall. On Sept. 7, the National Weather Service Weather Prediction Center noted that at 5 a.m. EDT (0900 UTC), Tropical Depression Gordon was located just 30 miles (45 km) south of Little Rock, Arkansas near latitude 34.5 degrees north and longitude 92.2 degrees west. The depression was moving toward the north near 5 mph (7 kph) and this motion is expected to continue today with a turn to the northeast Saturday, Sept. 8. The estimated minimum central pressure is 1013 millibars. As with any tropical system over land, heavy rain and flooding is a main concern. Gordon is expected to produce total rain accumulations of 3 to 6 inches over Missouri into the Midwest, with possible isolated maximum amounts of 10 inches through Saturday night. This rainfall will likely cause local flooding and flash flooding.